A couple of weeks ago I was playing with a program called AndreaMosaic. What it does is takes a bunch of pictures and arranges the to look like another picture. This sort of thing is more commonly known as a photomosaic. What I did was upload all of the Twitter avatars of everyone who is following Cigar Rights of America on Twitter. The thing is that since there were only slightly more than 400 followers at the time the ending image looked horrible. So, I cheated and created the image that you see above by reusing images as often as the program wanted to use them and by having more tiles (images) make up the mosaic. I also created this other photomosaic that you see below using the images less often, that means less tiles.That also means that you can make out the individual images a lot better. The reason why I like this second one the most is because you can actually see the individual pictures that make up this photomosaic. And, if you click on this image, you can see a larger rendering of this image. 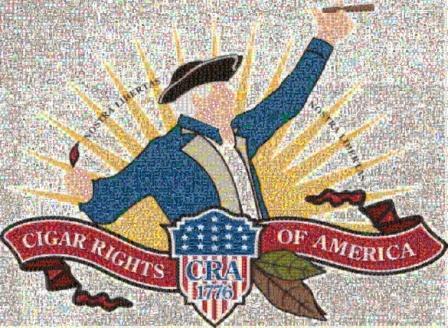 So you can see the individual avatars that make up the Cigar Rights of America logo even better. Creating these photomosaics only took a couple of hours. Oddly enough, the most time consuming part of this endeavor was the manual uploading of all the Twitter avatars. That involved lots of clicking and some file conversions – not fun. Actually creating the photomosaic was a snap because AndreaMosaic automates the process, all I had to do was put in a couple of parameters and ipso facto you get what you see here! As I write this I am smoking an excellent Arturo Fuente Chateau Fuente (natural) but last night there was this cigar that exploded when I cut it. No, it was not filled with TNT or Cemtex. It was just way too dry. The worst was that, upon cutting The Brick, tobacco fragments sprayed every which way but the ash tray! I was mortified. Here I am, at this award winning French restaurant, and I was responsible for this long filler carnage on the white cloth table. To add insult to my malfeasance as the resident cigar expert at the table, the cigar was bad. Luckily, most of my table mates had not yet arrived and the ones who were there were understanding. Even John, who drove over an hour from Temecula and fell victim to the shrapnel, wasn’t annoyed. After the dinner was over I realized there was a couple of ways I could have avoided this explosion. The best way to avoid exploding cigars is by not cutting them. Just put it in your humidor for a couple of months and then smoke it. But, if you really want to smoke a cigar that is a little too dry there may be a way to do so without letting tobacco rain. If you gently press against the cap with your thumb while cutting it then there should be no pyrotechnics. I tried this tactic with the Fuente that I am currently smoking and, even though it was properly humidified and wouldn’t have exploded anyways, it works. The cap stayed on the cutter with the gentle application of pressure that I put on it. While an exploding cigar is hardly something that most cigar connoisseurs will encounter with any regularity it does occasionally happen. In an effort to mitigate any more such explosions, I will continue to slightly press against every cap that I slice. It does not take any extra effort and is well worth it if it prevents any more explosions. My first cigars were some Arturo Fuentes from a local tobacco shop. These cigars ignited my passion for cigars and I am forever grateful to my mom for getting me those sticks. In no way am I overstating the facts when I say that cigars have enriched my life. So, thanks mom and thank you to the brick and mortar (B&M) that started me on this journey. Unfortunately, I don’t live on Calle Ocho. Cigar smoking is just not that important in my area. The B&Ms in my neck of the woods are lackluster, at best. Yesterday, I went to a new shop that, from the outside, looked promising. It was actually a cigar shop(!) – so it should have a ton of cigars on hand. Or so I thought. Seriously, that is what he said. If you don’t know the Casa Magna was the #1 cigar for Cigar Aficionado in 2008 and it isn’t milder (I guess it’s milder than some other cigars but it isn’t, by any means, a “mild” cigar). So, even when I’m lucky enough to find a place that has a moderate selection of cigars, the proprietor has a poor knowledge of the products he is selling. My stance on B&Ms can be summarized thusly: If you have a good one close by then, by all means, go there. It is worth paying a little extra for cigars if you have a great proprietor and can get some camaraderie from going. But, even if I had one by my house, I would still use online cigar shops. Maybe I’m just different from the average cigar smokers. Personally, I don’t like going out all that much to smoke my cigars. When I go to a restaurant this Thursday for a cigar smokers’ dinner that will be the first time I will be going to a cigar event. I’m sure I will like it but, on average, I like to smoke alone. Smoking alone is a way for me to relax and enjoy my cigars. Maybe if I had a good friend who also smoked cigars I would smoke with him like Denny and Alan do at the end of every episode on Boston Legal. What all this means is that I probably wouldn’t be going to a B&M for the camaraderie alone. Furthermore, there’s just no way for a B&M to have the same selection and prices that an online shop has. The online shops regularly have great deals as well. If it weren’t for the samplers offered online I would probably not have the same exposure to cigars that I currently have. Heck, if it weren’t for online shops like the ones that are advertised on my site I probably would not be blogging about cigars. And please don’t think that I wouldn’t be advocating online cigar shops if they weren’t advertising on my site and giving me the occasional freebie. I have a little more ethics than that. For what it’s worth, online cigar shops will continue to be my go-to source for cigars. There are just too many deals and the prices are so much better online. When a truly good B&M opens up by my house I will go there frequently. Until that fortuitous day comes my cigars will be delivered – properly humidified. I have a new sponsor with Mike’s Cigars. You can see their link in the sidebar – Cigar Samplers. I was just looking through their samplers page and I found some really great deals that I think you guys might enjoy. Additionally, if everything works out alright, and I think things will, the good people at Mike’s Cigars will be submitting a guest review every now and then. In order to maintain your trust, which is a paramount concern of mine, I will prominently say at the beginning of each of their reviews that they are a sponsor and their reviews will be put into a special category (I’ll figure that one out later) so that there will be no confusion. Having someone new review cigars may be a little bumpy at first but I will work with these guys to make sure that their reviews are up to par. Again, take a look at Mike’s Cigars and their wonderful sampler packages!